How often do you find yourself without a pen and having to then ask to borrow one? You think you have a pen on you but you really don’t, or you’ve absentmindedly left it at your last meeting. This used to bug me, however it doesn’t anymore, and hasn’t for the last 5 years. Simple I created two rules. Rule #1: I am only allowed to write with a Blue Bic Pen. Rule#2: I am only allowed one pen per quarter. 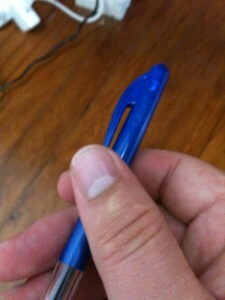 When it runs out of ink, I break it in half, throw it out (so I don’t pick up a pen that doesn’t work). I picked up a box of blue bic pens (and do so every couple of years now). In 5 years I’ve lost my pen twice (first time as I was quite sick and second time travelling). Once you put the constraint that you only have one pen, if you loan a pen you expect it back, also if you pick up another kind of pen you realise immediately (hey this isn’t my pen) so put it down. Also you actually keep a track of your one pen (ideally keeping on you most of the time). That’s how I stopped losing Pens. Slightly irrelevant but a nice little life hack. This entry was posted on Wednesday, February 24th, 2010 at 5:14 pm. Nice advice! And one I think most of us can relate to. I still have my engraved Parker pen despite losing it twice – got to watch out for the space between car seats, these are very dangerous for pens. Ah yes they are indeed! I think it’s wrong to victimise just one pen in such a cruel manner, pens should be allowed to roam free in their natural habitat. Just look at those poor pens that are chained up at the bank, unable to fulfil their hopes and dreams. Next thing, you’ll suggest we only wear one pair of socks so they don’t get to use the magic wormhole in the washing machine to escape to another dimension where socks come in threes. I agree. I was consistently losing pens…so I spent some decent $ on a nice Parker and have never had a problem since. Reminds me of John Bates’s talk we were at. Reffered to money being very expensive early on and those $1 pens/pencils you buy now are acutally worth $200 (or something like that).